‘Superfly’ Fights at the Stubhub Center Sept. 9th! LOS ANGELES, CA, July 6, 2017 — Southern California’s iconic outdoor boxing venue, The StubHub Center in Carson, California, home to numerous legendary nights of action over the last decade, will play host to the highly anticipated “SUPERFLY” triple header set for Saturday, September 9, it was announced today by TOM LOEFFLER, Managing Director of K2 PROMOTIONS. NEW YORK CITY, March 16, 2017 — On Wednesday afternoon at Madison Square Garden a press conference was held for the HBO Pay-Per-View undercard fighters featured on the highly anticipated divisional clash between Unified Middleweight World Champion GENNADY “GGG” GOLOVKIN, (36-0, 33 KO’s) and WBA Middleweight World Champion and Mandatory Challenger, DANIEL “THE MIRACLE MAN” JACOBS, (32-1, 29 KO’s) this Saturday, March 18 at the famed venue in New York City. Gennady Golovkin, at left, savages Kell Brooks. LOS ANGELES, CA — K2 Promotions, guided by Managing Director Tom Loeffler, continued their 12-year legacy of promoting boxing’s biggest international events in 2016 featuring a number of the sports’ most popular and exciting fighters. ‘GGG’ Ratings Soar, ‘Chocolatito’ Hits High Water Mark in 1st Headliner! 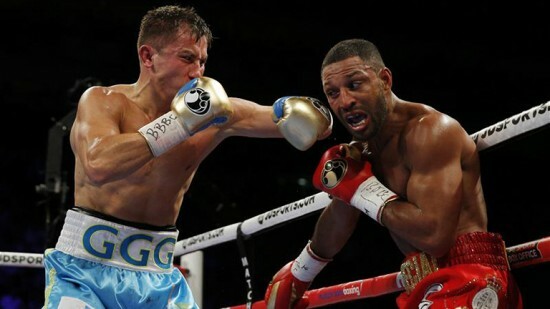 Gennady Golovkin, at left, slams a left hook to the jaw of Kell Brooks (photo by Matchroom Boxing). LOS ANGELES, Sept. 14, 2016 — Boxing Superstar and Unified Middleweight World Champion Gennady “GGG” Golovkin’s, (36-0, 33KO’s), fifth round stoppage of previously undefeated UK Superstar, “The Special One” Kell Brook, (36-1, 25KO’s) was viewed by a combined 1,436,000 viewers on HBO World Championship Boxing this past Saturday, September 10, marking it as the most watched HBO boxing event in 2016 and the highest rated HBO international boxing telecast in many years viewed live by 843,000 fans and same-day rebroadcast by 593,000 viewers. 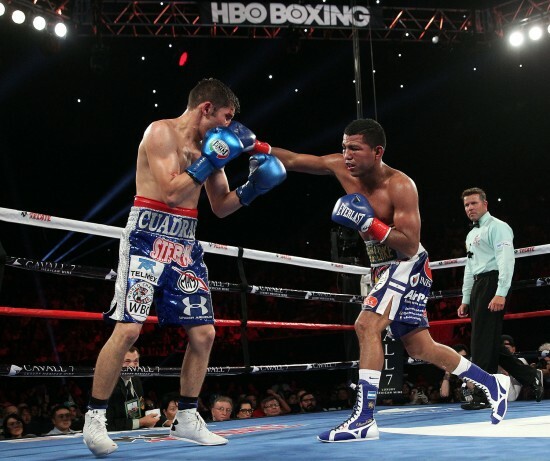 ‘Chocolatito’ Gonzalez Tops Cuadras in 12 Round Decision! Gonzalez, at right, lands the right on Cuadras. LOS ANGELES, September 10, 2016 — Number one Pound-for-Pound Fighter in the World and WBC Flyweight World Champion Roman “Chocolatito” Gonzalez, won a 12-round unanimous decision over Carlos Cuadras to capture the WBC Super Flyweight World Title, Saturday, September 10 at The Fabulous Forum in Los Angeles.